My wife, Suzan, and I were in the U.S. for a conference when Ecuador was hit by its biggest earthquake in decades. We learned of it immediately from our friends and neighbors in our hometown of Cotacachi in the Andes Mountains in northern Ecuador, where the quake was felt but caused no extensive damage. The story was different on Ecuador’s northern Pacific coast. Entire towns have been flattened. Hundreds… perhaps thousands… of people have died, and thousands more have been injured or left homeless. This part of Ecuador has been devastated. Ecuador, like Japan, another earthquake-prone country, is on the “Ring of Fire,” a place where parts of the earth’s crust meet and grind against each other in the ultra-slow-motion dance that rearranges the planet’s continents and oceans. Ecuador, like Japan, has had earthquakes before, and will have them again. Nothing will stop the inexorable motion of the earth’s crust, just as nothing will stop the formation of other natural phenomenon such as tornadoes, tsunamis, and hurricanes. In fact it was a hurricane, not an earthquake, that first brought the unpredictability and inevitability of natural disasters home to Suzan and me. Many years ago, we’d scheduled a visit to Belize and arrived on Ambergris Caye just a week after it was mauled by Hurricane Mitch. The devastation was astounding, as you might expect after a major hurricane hits an island that is, in most places, only a meter above the surrounding sea. The cleanup had started, but hadn’t progressed very far, because it’s difficult to get personnel and resources to remote places like islands, and Belize is not a rich country to begin with. As Suzan and I walked around Ambergris Caye after Hurricane Mitch, I remember feeling shame and embarrassment. It wasn’t really our fault that our vacation and exploratory trip had coincided with the aftermath of a natural disaster, but there we were trying to find a good hotel, a decent restaurant, and arrange a dive or two while people were digging themselves out of the remains of their battered homes and businesses. This is a sentiment we’ve heard from other people as well. We heard it along the Riviera Maya after a major hurricane there, and we heard it from people in Antigua a couple of decades ago as people started to arrive again after a devastating civil war crippled tourism in Guatemala. This will be the case along Ecuador’s northern coast as well. In fact, Ecuador’s tourism bureau has already released a statement saying, essentially, that Ecuador is still open for business. Although the entire country has been hit emotionally by the earthquake, only a small part has been affected physically. 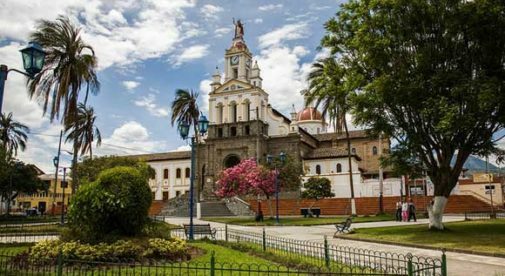 The southern coast, the mountains, the rainforest, the Galapagos Islands, and major population and tourist areas including Quito, Cuenca, Loja, Vilcabamba, Otavalo, and our hometown of Cotacachi are largely unscathed. The entire country is devoting all its available resources to helping victims of this natural disaster, but the country’s resources depend in large part on tourism and foreign investment. The people of Ecuador are saying much the same thing we heard on Ambergris Caye after Mitch… the best way you can help in the long run is simply to be here, to continue to do business here, to keep visiting here, staying here, living here, enjoying yourself here. It seems counterintuitive in the face of so many lost lives, so much destruction, so much suffering and pain in places like Portoviejo, Pedernales, Canoa, Bahia, Manta, San Clemente, and the many little fishing villages along Ecuador’s northern coast that bore the brunt of the earthquake. But it’s true… the worst possible thing to do is write off the entire country as a place to visit or invest. That would simply choke off a major source of revenue and resources that Ecuador will sorely need to rebuild the affected area and try to heal the lives of the people there. Natural disasters are…natural. They are an unavoidable part of the mechanics of the planet. They happen to varying degrees and in varying ways in every corner of the globe. And it’s the nature of the people stricken by these natural events to mourn, to pick themselves up, and to rebuild. In many ways, that’s the main story line of human civilization. It’s what we do in the face of natural forces that are largely out of our control. And in reality, as much as we like to pretend otherwise, almost everything in nature is ultimately out of our control. Civilizations have been doing this for thousands of years, and we’ll keep on doing it, just as Ecuadorians and the expats who live there are doing now…with the help of everyone who continues to visit Ecuador and enjoy its remarkable hospitality and natural beauty.